Orange County, CA is headquarters of many Fortune companies including: Pacific Life, Ingram Micro, First American, Broadcom, Standard Pacific; as well as: Oakley, Hurley, St. John Knits and Wet Seal. 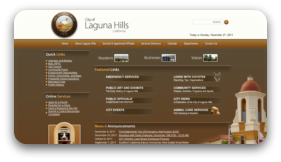 Many employees of these respectable corporations choose to make the city Laguna Hills their home. Laguna Hills, CA is a fantastic city to raise a family. Residential real estate over the long term has proven to be a positive investment in Laguna Hills. Records show that home values in South Orange County have historically been stronger than other areas in California. The Laguna Hills Real Estate area represents the classic Orange County lifestyle, with both luxury and blue collar neighborhoods.